You can’t break it and you can’t sink it — that’s the message the folks at SeaHunter Boats want to get out with their “Extreme Boat Test” promotional video. A “tease” video released to Soundings Trade Only stops short of showing the boat striking the concrete. 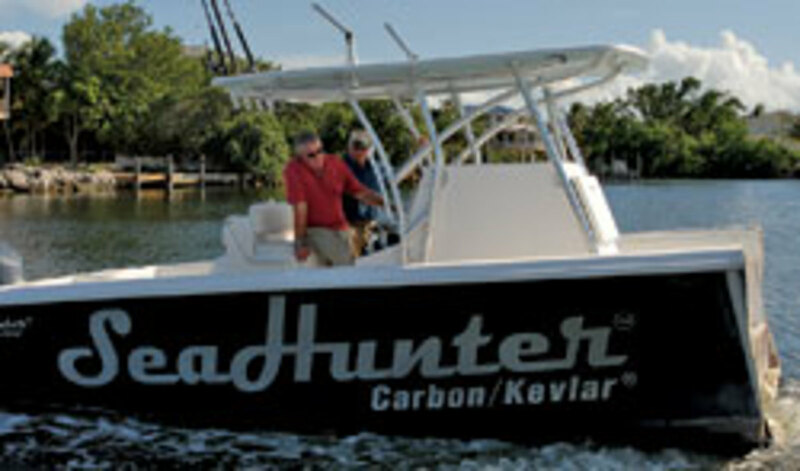 SeaHunter was planning to show the boat and the full 7-minute video at the Oct. 27-31 Fort Lauderdale International Boat Show. The company also intends to use the footage for television and online commercials. Montalvo and Plantation Boat Mart CEO Elias De La Torre III initially planned to drop the boat to assess its strength. The idea, however, morphed into a marketing campaign, Schiffer says. “As we got into this we realized we had one hell of a promotional event, which is great during this economy,” he says. In the video the boat hits the concrete and bounces twice before coming to rest, Schiffer says. SeaHunter removed the twin 300-hp Yamaha 4-strokes and the fiberglass T-top before the drop test but reinstalled them before the boat was cut in half, he says. The next day, SeaHunter carried out the second part of the promotional event. Jerry Sanders of Poseidon Towing & Salvage cut the boat in half to prove its unsinkability — a la Boston Whaler’s well-known marketing campaign. The cut took three hours and required two saw blades and two chainsaw chains. SeaHunter then took the aft portion of the boat for a test ride, bringing it up to 31 mph, Schiffer says. “Originally we were just going to idle around the marina and out in the bay and take pictures, but the boat was so stable and floating so high and so well that we planed it off. It looked like a landing craft from World War II,” Schiffer says. Back at the marina, 32 volunteers boarded the half-boat. “The only reason we did not have more people on the boat is because we had used up all our volunteers,” Schiffer says. SeaHunter’s vacuum-assisted laminate technology uses Kevlar for the hull and carbon fiber for the hatches and console, Schiffer says. The builder uses vinylester resin in a vacuum process to sandwich a composite coring between the laminates, he says. The voids between the hull and deck are filled with closed-cell high-density foam for buoyancy. The Tournament 35, a long and narrow deep-vee, is the third-largest boat in the SeaHunter fleet. With twin 300-hp Yamahas, it tops out at 60 mph and cruises at 31 mph with a mileage rating of 2.1 mpg. A Tournament 35 goes for about $220,000 with the Yamahas and an electronics package. 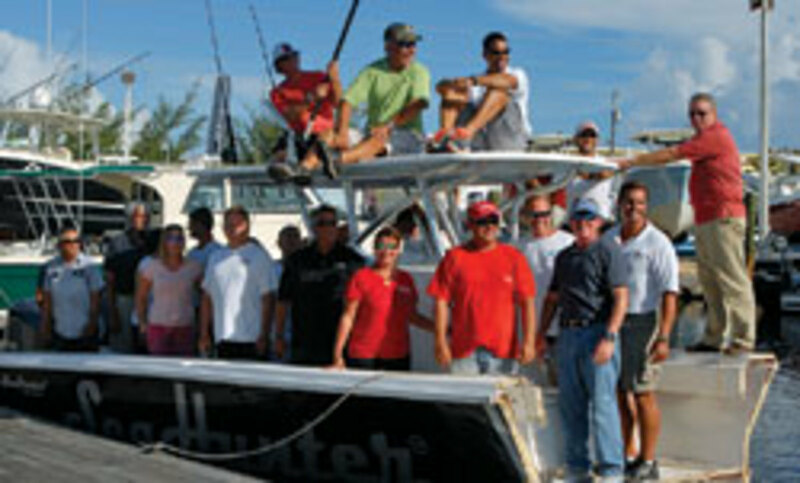 SeaHunter has been in business for about 10 years. The factory-direct builder, which operates out of a 46,000-square-foot facility, averages about 30 boats a year and expects to complete 45 to 50 this year, Schiffer says. The company employs about 40 workers and builds three inshore models (18, 22 and 24 feet) and four offshore models (29, 35, 37 and 40 feet). The company introduced its first boat — an 18-foot flats boat — at the 2003 Miami boat show. The Tournament 35 debuted a year later. Schiffer says he knows of no other boat-drop stunt. “So I guess we’re the first to do this,” he says. Schiffer and Montalvo had talked about dropping the 7,300-pound boat from 40 feet. “When we actually saw it up there at 20 feet, we said, ‘OK, OK, that’s high enough,’ ” Schiffer says.